It seems hard to imagine, but Otis Redding was only a recording artist for a few years — roughly the same amount as Kurt Cobain or Jimi Hendrix — before he was cruelly taken away from the world in a plane crash. But in those few years, I think that he left a legacy that was as important as any in American popular music: a gritty rendering of soul music that he was just beginning to expand when he died. We’ll get into all that in the next couple of weeks, but for now, let’s begin at the beginning, side one track one title song of his Atco debut, Pain in My Heart, which established one of his templates: the slow waltz-time torch song that built up and broke down at will. Lord where can she be? 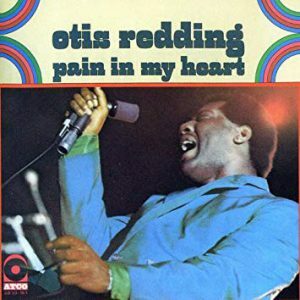 From the moment he starts singing, Otis Redding is totally and utterly arresting: listen to how he rushes “Pain in my” only to elongate the note not “hearrrrrrrrrt” while he simultaneously letting his voice break as a signifier of the pain he feels. Of course, it also doesn’t hurt that he’s being backed by one of the greatest combos in music history: Mar-Keys, aka Booker T & The MGs featuring Steve Cropper on guitar, Duck Dunn on bass, Al Jackson on drums and Booker T Jones on the keyboards, and occasionally augmented by Isaac Hayes on the keyboard and always featuring an expertly-deployed horn section. So on “Pain in My Heart,” the horns laid back on the verses — letting Cropper lead with an expertly-deployed series licks and riffs and letting Jones, Dunn and Jackson hold down the 6/8 rhythm — and then swelled on the chorus as Otis makes his request. On that first “Come back,” everybody else slams into a dead stop so it’s just Otis all by his lonesome, begging and pleading “come back, come back” (later on it’s “love me, love me“) in such a way that not only do you know that she’s never going to accede to his request, you also know that Otis knows that she’s never going to accede to his request. But still, you gotta try, don’t you? And that was one of the things I always heard in a lot of my favorite Otis songs: the sound of someone trying and trying because he doesn’t know what else to do.